A vegetable that is easy grow, is ornamental and is tasty to eat, the Globe Artichoke is all three. You can grow them in the vegetable garden, or in the ornamental garden where these large thistle like plants make a stunning feature. They will flower, with large purple flowers, however if you are growing them to eat, you will not wait for the flowers to form. Another use is that Globe Artichokes are very good for attracting Ladybirds to the garden, they act as a host plant for these beneficial insects. The easiest way to grow Globe Artichokes is form rooted suckers. You can also grow them from seed that is planted in early spring. With both ornamental and edible uses, these are a easy plant to grow in the vegetable garden or in the general garden border. The botanical name is Cynara scolymus and the key to growing these attractive edible plants is soil preparation. They do not like wet clay soils, so excellent drainage is a must. They do like a rich fertile soil, so we dig in a fair amount of aged cow manure before planting. One of the main tricks to growing these plants is to provide protection over winter. In colder areas, subject to frosts and long cold wet spells, they need to be planted where they will receive some protection. You can grow these plants in late winter to early spring, from seed or seedlings. Seeds are best planted in pots in August. Seedlings are ready for planting out in September. They do like cool summers, so they are not really suited to tropical areas. The best way to plant is from seedlings or suckers from last years plants. If you are starting the plants from offsets, use a sharp knife or spade to separate them from the old parent plant. You are looking at good new growth to plant. Plan the position carefully, globe artichokes are a large plant, the foliage will reach 1m in height with ease and they will spread over 1m. So plant at around 1m apart for a dense growth, or give them around 2m if you are going to make this a feature plant in the border. Start by preparing the soil, dig in lots of well rotted compost, some blood and bone and some aged cow or sheep manure. This is best done 4 weeks before planting. To grow successfully Globe Artichokes prefer a cool moist position. They can be treated as an herbaceous perennials and they will last ro 5 – 6 years if you wish. It is important to pick the flower buds before they open if you wish to eat them. Add potash to the soil mulch well, keep moist and artichokes will flower well. 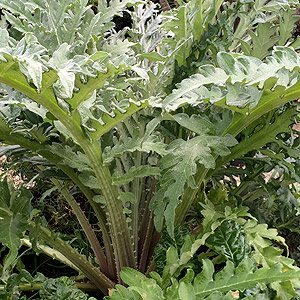 Artichokes also have a place in the perennial border as well as the kitchen garden with great foliage and interesting large blue thistle like flowers artichokes add interest. It is said that ladybirds love artichokes, so try them to attract these desirable bugs to the garden. Divided every 2-3 years. Harvesting is usually only on mature plants that are at least a year old. The ‘Chokes’ are harvested at an early age so they do not become coarse and inedible. They must be picked before the flower actually blooms. It is only the heart of the fleshy base leaves that are eaten. Plants will continue on producing for 5 – 8 years, although we divide and renew ours every 4 years. After the plants have completed flowering, you can cut them right back to the ground ready for next season. You can cut them back at the end of the season to around 20 – 40 cm, the foliage will probably go yellow and this is the time to cut back. This will tidy up old foliage. You will also find that plants produce offsets, these can easily be removed and replanted elsewhere in the garden. Mulch around plants in autumn. Green – These include the high yielding Imperial Star, which produces well in the first season. Thornless buds, flowers hold tight for longer than most which makes it popular for eating. Purple – Also known as Violetta de provence and French Purple, very decorative purple flowers. Violetta di chioggia – This is an heirloom variety from Italy, violet purple heads or flowers, very decorative and tsty as well. It will produce a few small buds in the first season and up to 30 after that. Romagna Violet – Another Italian variety, not readily available. Romanesco – Large purple to bronze flower buds from this Norther Italian Variety.